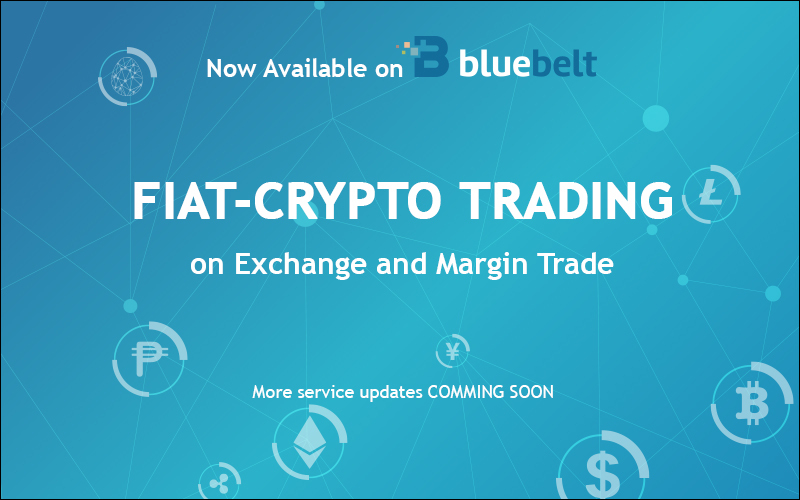 We at Bluebelt are announcing the initial launch of our fiat-crypto pairs on our Exchange and Margin Trade platforms. Fiat-crypto pairings will give traders a layer of stability in their trading activities, unlike in trading crypto with other crypto like BTC or ETH, both of which have volatile price movements. This stability of fiat currency becomes more critical in our Margin Trade platform, where traders can use up to x100 leverage to maximize their potential profits at the risk of bigger potential losses. As of December 15, 2018, margin traders will be able to trade BTC, ETH, LTC, XRP, and BAB ( Bitcoin Cash ABC) with USD. In the coming months, we will continue to add more major currencies like EUR, GBP and JPY, and more minor currencies like VND, IDR, PHP, MYR, MMK, etc. On the same date, classic Exchange traders will be able to trade all our listed cryptocurrencies with major and minor fiat currencies. For a user from a country that uses minor currencies, he or she will only be able to see his country’s currency. For example, a user from the Philippines will be able to see crypto paired with only PHP. More service updates will come soon so we advise our users and all those interested to tune in for the following news. Làm thế nào để mua Bitcoin ? Làm thế nào để bán Bitcoin ?